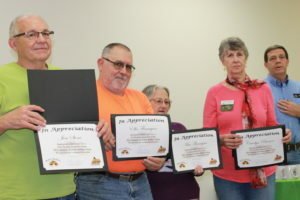 The Master Gardeners Association of Rogers County (MGARC) aspires to train volunteers to be effective community educators in gardening and environmental stewardship. Volunteers are trained by OSU faculty and staff. Leadership for the Roger County MG program is provided by the Rogers County Extension Horticulturist, John Haase. The 2018 Master Gardeners course is currently ongoing. Applications for the 2019 course (beginning in November 2019) will be available in the fall. The 2019 Master Gardener Classes for Rogers County residents will begin November 30, 2019. Classes will be held from 9:00 am to 3:00 pm on Thursdays (with a break over the holidays) in the Rogers County Building and run 14 weeks through the end of March, 2020. Topics to be covered include botany, turf grass, entomology, fruits and nuts, vegetable gardening, annuals/ perennials, native plants and pollinators, and many many more. Classes are conducted by OSU faculty or OSU extension horticulturalists. There is a $175.00 fee for the class. Two field trips, resource notebooks, and field books are covered in the cost of the class. Contact John Haase, the Rogers County OSU extension horticulturalist, for more information. CLICK HERE to view a brochure about Master Gardener classes. CLICK HERE to read the December 2017 Value News article about the Rogers County Master Gardeners. The Master Gardeners are involved in a wide range of local projects. CLICK HERE to take a look at the current list. 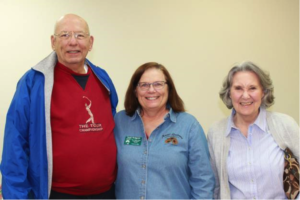 2019 elected officers: Back row from left to right – Co-President, Kathy Klawitter; Co-President, Jim Stone; Vice President, Butch Kindley. Front row from left to right: Treasurer, Grace Acquino; Secretary, Trudy Hedgepath. 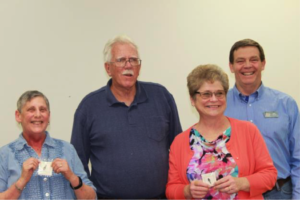 From left to right, Don Fletcher and Trudy Hedgpath earned a 5 year member pin. Sue Mobley earned a 10 yr member pin. Others not pictured were Class of 2013 members Carol Chuck, Meg Counterman and Connie Wells; Class of 2008 Linda Harrison and Wilma Thompson. 2018 Garden Trowel pin awarded to volunteers working in the Teaching Garden for more than 25 hours. 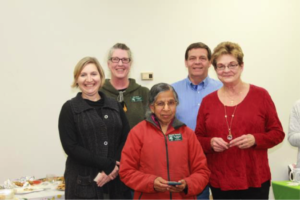 From left to right are, Lisa Luce, Patty Moree, Sumathy Varrnarth, Joan Sherwood and in back, John Haase, OSU Extension horticulturalist. More 2018 Garden Trowel pin awardees. From left to right are, Miriam Leggett, Jack Hannah, Phyllis Stearnes and John Haase.